Texas landowners and environmental activists are fighting side by side to stop construction of the Keystone XL pipeline. TransCanada, whose pipeline would transport tar sands (bitumen) from Canada to the Gulf of Mexico, jeopardizing the environment along the way, broke ground in September on the Gulf coast segment. 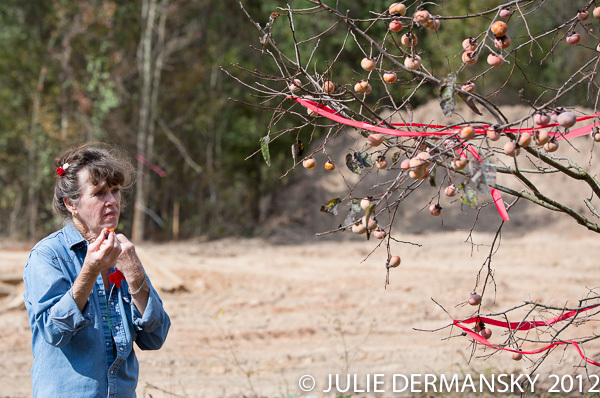 Eleanor Fairchild, a 78 year old Winnsboro, Texas, property owner, had never before participated in protests or acts of civil disobedience, but when it became clear TransCanada’s pipeline would be transporting tar sands instead of crude oil, as she had been told, she knew it was time to fight back. 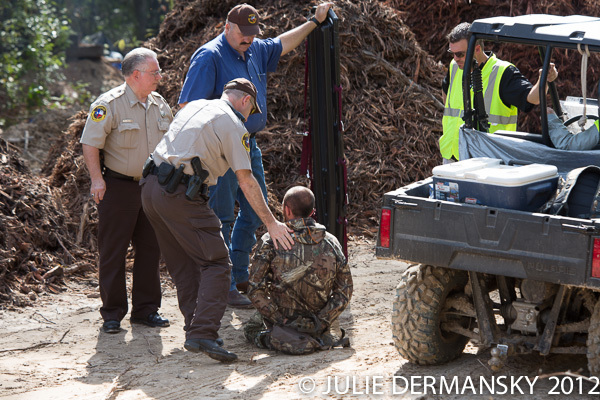 On October 4, Fairchild and actress/activist Daryl Hannah stood in front of some heavy machinery, halting TransCanada’s work until they were arrested. Fairchild’s interest in the pipeline’s environmental impact began three years ago when she received papers from TransCanada saying they needed access to her land that was in the pipeline’s path. But she refused to sign their papers or take their money for the easement they demanded. As far as she’s concerned, TransCanada’s financial offer is insufficient and the company’s ability to safely transport tar sands across America is unproven. She doesn’t blame others for signing their papers and taking the money; fighting TransCanada will be expensive and time consuming. Air Force veteran David Hightower encouraged his mother to sign on with TransCanada paperwork because she was ill and the stress was taking its toll. As a result his vineyard has been destroyed. TransCanada gave him an additional payment when the media got hold of the story, but money can’t replace 20 year old grape vines, Hightower says, living under the threat of an oil leak is unnerving. 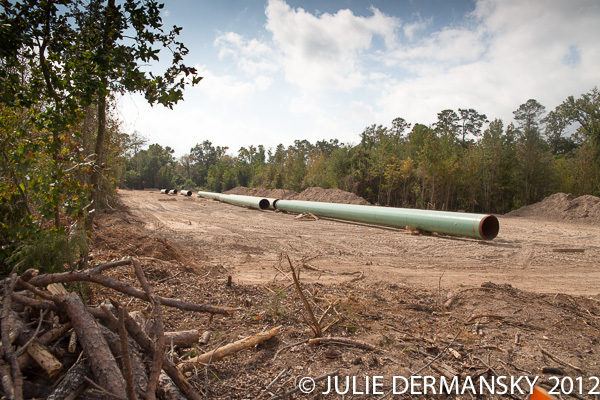 Can the pipeline withstand the pressure of the cars passing over it? If his ground water is contaminated, his insurance won’t reimburse him. 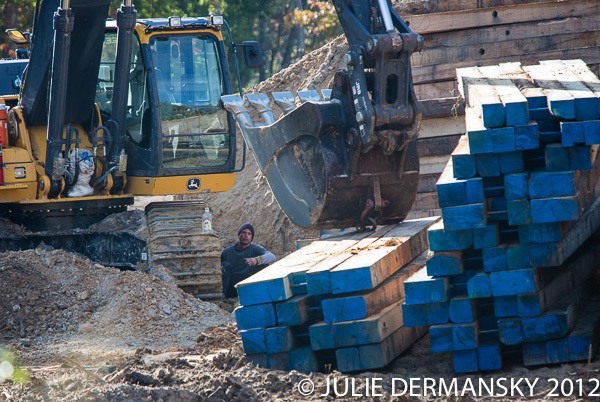 Where is the oversight in the construction process, he wonders, since the environmental impact studies are lacking. Julia Trigg Crawford is fighting Trans Canada on a different tack: she points to the misuse of eminent domain laws. 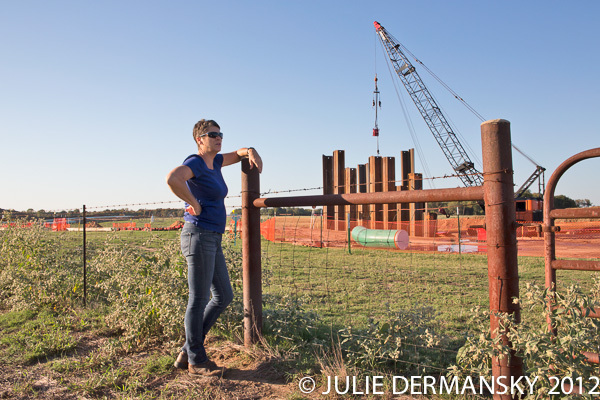 Recently her fight was dealt a blow when The Lamar County court ruled TransCanada can their for take her land through eminent domain. She is appealing that ruling and promises to go all the way to the Texas Supreme Court if she has to. What started as a personal battle has become a campaign to protect America from corporate bullying. Crawford was labeled an activist by the TransCanada attorney, James Freeman, a label that’s not particularly popular in the Texas/Oklahoma border country. She, however, sees herself as a patriot, standing up for all Americans’ property rights. Susan Scott signed her contract with TransCanada after a two-year battle, accepting $20,000 after TransCanada rep Peter Porter made it clear if she didn’t agree, TransCanada would sue her. She would be responsible for all court fees, and would receive practically nothing for the easement. Signing the contract isn’t stopping her from fighting, she says, because she found out after the fact she had been sold a bad bill of goods. Along with individual actions, larger protests are making an impact. 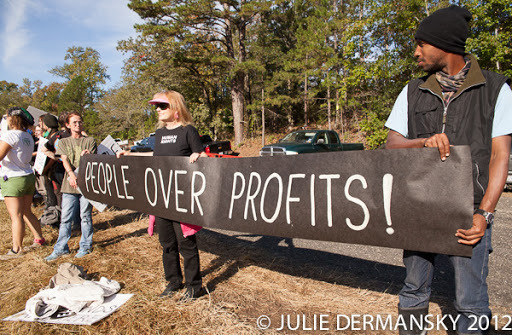 The Tar Sands Blockade’s October 15th protest followed a two-day training camp. 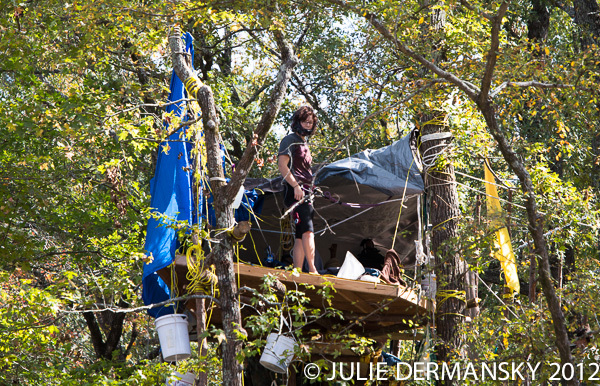 Fifty participants made their way to Tree Village on David Daniel’s land in an effort to resupply the tree sitters who have been camping out for over 28 days, despite threats of being charged with felony trespass. According to the New York Times, Daniel asked the tree sitters to leave. Daniel’s lawyer said his client had reached an agreement with TransCanada and would no longer fight the easement. 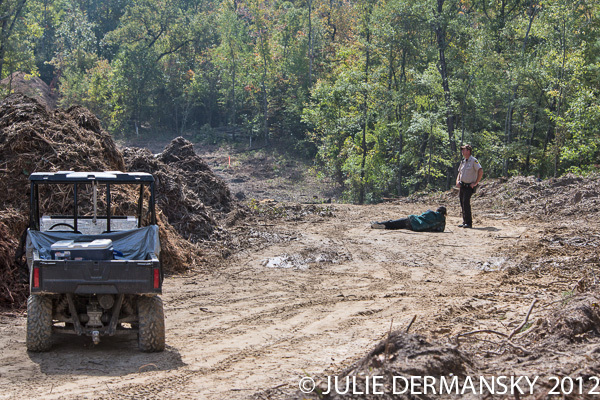 Now media and outside monitors are being kept off Daniels’ land by a TransCanada police detail. Two New York Times reporters were handcuffed and detained while attempting to cover the story. 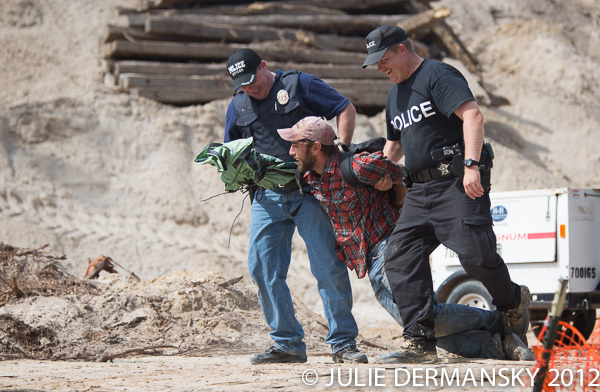 Ron Seifert, a Tar Sands Blockade media spokesman, described the day’s action as bittersweet. 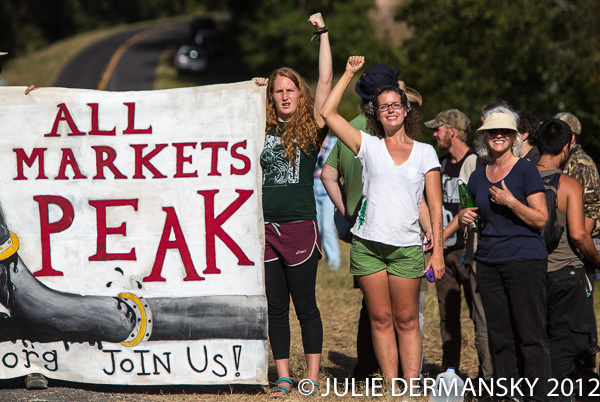 Although they effectively shut down work on one site, it will take a much larger multi-pronged approach including legal injunctions and more direct action to stop the pipeline. At least ten of his friends have been arrested during the action. He hopes the media will undertake more investigative reporting about the Keystone XL pipeline and the devastating environmental effects of tar sands, the dirtiest of dirty energy sources. The group is not against energy consumption. They just don’t want multinational corporations to dictating America’s energy policy and believe there are other less environmentally destructive alternatives. Please check out my story on the Atlantic Wire and my Story for the NRDC’s onearth blog. and a set of photos on Flickr and video clips: Julia Trigg Crawford reads letters from supporters, Eleanor Fairchild Confronts a TransCanada employee on her land, Tar Sands Blockade sends message to Pipeline Builders on OCt. 15th.